Avoid the perils of the scatter gun! The scattergun hits anything but the target! A scattergun sprays bullets everywhere with very few hitting the target, this is how some businesses approach their marketing! They distribute a few flyers get no response so think flyers don’t work. They attend a few networking events don’t win any business so write off networking. They place a random advertisement don’t get any enquiries so that too is condemned to the scrapheap! 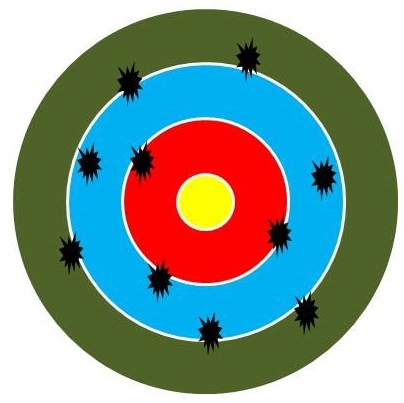 The scattergun rarely hits the bulls eye and neither does haphazard marketing. Marketing has to be highly targeted and repeated. Have you ever been invited to participate in an advertising awareness survey? How many of the adverts could you recall with any degree of certainty? I suspect that the only campaigns you could remember were the ones that coincided with a purchasing need or that bombarded you every time your turned on the TV or radio, visited the cinema, opened a newspaper or magazine and surfed the Internet. We are bombarded with marketing messages all day every day, unless they are very clever or very appropriate to our needs at that precise moment we will instantly forget them. Your customers are just like you. Unless they are looking for your product or service at the particular time and in the particular place you are marketing they will forget all about you. Even your happy customers will forget about you unless you stay in touch! Be really clear what you want to achieve. Set SMART objectives for your campaign. Ensure that your target is obvious. You don’t have to appeal to everyone, only those who may have a need for your product or service. Don’t try to be too clever. Keep your message straightforward, explain the problem you solve and how your offer solves that problem. Don’t try and sell more than one thing at a time. Make it safe for people to buy, offer guarantees, publish testimonials etc. Tell people what action you want them to take. Repeat. Repeat. Repeat. Tests show that it can take 5 or more viewings of a message before your target even recollects seeing it. One business measured how many touch points they needed to make a sale and it was 28! So forget the scattergun a laser will serve you better! If you need help in laser focusing your marketing book your free no obligation, 30 minute consultation here. This entry was posted in Marketing, Small business advice and tagged Marketing, small business marketing, targets by glendashawley. Bookmark the permalink.